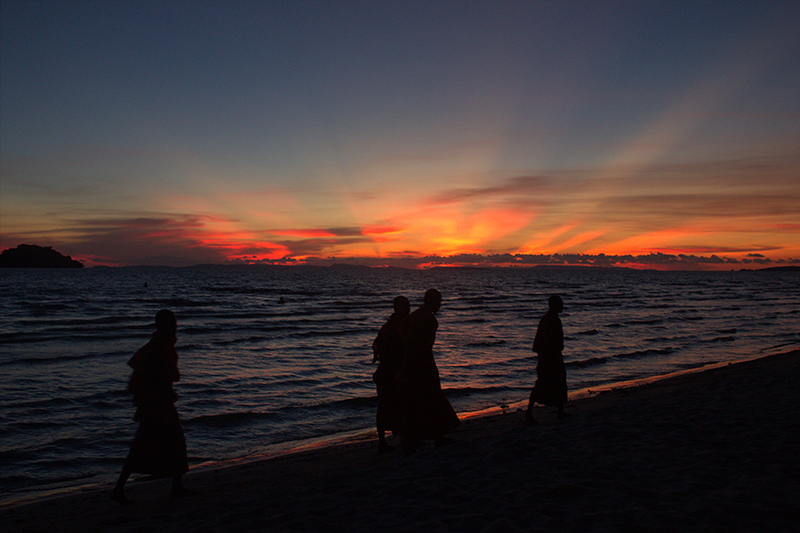 I recently saw some amazing photos of Sihanoukville on my Facebook feed. I asked if the poster, Iain Donnelly, would write about it and let me post some photos on Asia Travelbug. I have added some section headings for navigation, but otherwise, this is his take on one of the newest beach getaways in Asia, Sihanoukville, Cambodia. Click here for info on staying in Phnom Penh, getting from Phnom Penh to Siem Reap, or on Angkor Archeological Tour 1, Tour 2, or Angkor Wat. Sihanoukville is one of Asia’s newer cities, having only been founded in 1960 around the construction of Cambodia’s only deep water port. So the building workers, and their families, effectively became the city’s first inhabitants. It only got its current name in 1964, so next year will be the city’s official 50th anniversary. The city grew in popularity as NGO staff based in Phnom Penh used it as a bolthole from the still unsafe Capital city, and it was not long till it also became a star of the backpacker trail. Getting to Sihanoukville is getting fairly easy. Simplest way is to combine with Phnom Penh and take an air conditioned bus the 4-5 hour journey down to the coast. (Around $10-12 dollars one way). There are other routes too, but they will depend on your point of departure and your budget. 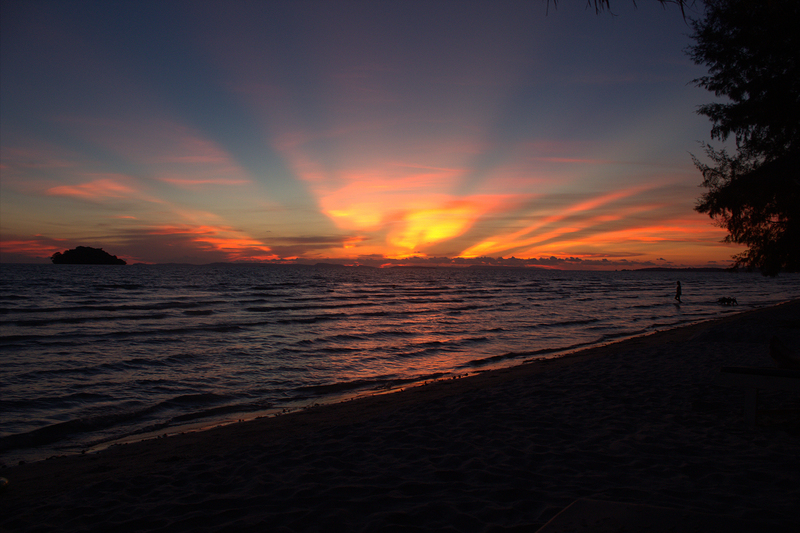 So, why come to Sihanoukville? Certainly not for an activity holiday, though there are one or two activities on offer; trail bike adventures in the Cambodia Jungle and Nautica on Otres Beach who hire out kayaks, windsurfers and small dinghies. But, like many of the smaller beach locations in South East Asia, the primary reason to come here is to kick back, relax, sit on the beach sipping a cold Angkor (the brewery is on the outskirts of the city), and enjoy the almost daily spectacular sunsets. 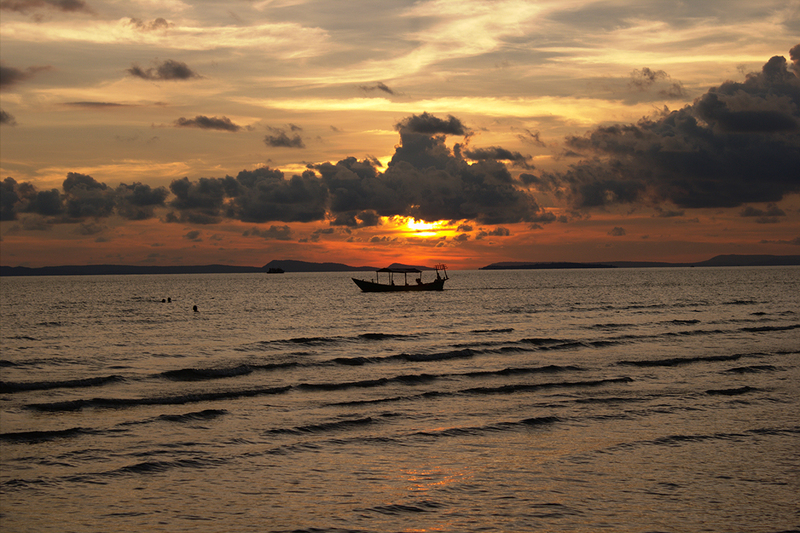 The most important aspect of Sihanoukville is the beaches, and they have plenty. Will discount Sokha Beach as this is now privately owned by the Sokha Resort, a monstrous carbuncle of a building that will only suit those with fat wallets and little taste. One of the main beach areas is Occheuteal Beach and Serendipity Beach; a long narrow strip that suits all budgets. From sea facing bungalows and guesthouses, to cheap bars and eateries, this is also the main beach location for night time fun. Serendipity seems to be the busiest of the local beaches, so if you are seeking peace and quiet, this may not be the one for you. Most beaches are pretty quiet through the week so finding a good spot is never a hard task! Otres (1 and 2) are the furthest out from the city itself (around 5/6km) and the least developed, and therefore the most idyllic. I stayed at the Secret Garden at Otres which was a marvellous place to stay, with great staff and food and plenty of loungers to lie on and soak up the rays or to sip a cocktail as the sun begins to set. However, their normal room rate is a little pricey for the area, but it is well worth checking sites like Agoda for good deals. Otherwise, there are a fair few cheaper choices along the same strip. The downside of Otres is the distance from town and the journey home (along very bumpy roads/dirt tracks) can be a little hairy, especially if you have hired a scooter! Tip; do the journey once or twice in daylight and note landmarks so you don’t get lost! Most northerly beach is Victory beach, original haunt of the backpacker hordes and still the location of choice for those on a tighter budget. Wide range of low to mid-range accommodation that will suit many. Last of the beaches is Independence Beach, another long strip of beautiful sand which could be even better, which brings me to my next point. Unfortunately, litter is a huge problem, and of all I visited, Otres was probably the most litter free (and even it had a lot brought in by the tide) It’s the same in the rural areas, plenty places where there are piles of refuse, and this is something the provincial government should address. Though to be more honest, I can see it more likely being local volunteers who start beach tidy days. *addendum* Having chatted to some ex pats in Sihanoukville, and gone onto some local forums, it would seem that there are now regular litter drives organised both by local businesses and some of the local schools. This includes entire streets being cleaned and the beaches cleared and even raked for cigarette butts. So it would appear my impression may have come from a point between such ‘Tidy Sihanoukville’ days. Next big attraction is the Islands. I never got out to any on this trip but spoke to my Khmer friend to get some idea what they are like. Main two worth a visit seem to be Koh Rong and Koh Rong Samlong which offer unspoilt beaches and very little development, so ideal for a day trip or a stay in one of the few bungalows. Sihanoukville is not really known as a diving destination, but there are 4 PADI dive centres and it seems an overnight trip to the island of Koh Tang offers the best, and least explored dive sites. Two islands worth forgetting about are Koh Pos and Koh Dek Koul. Both leased long term by Russian oligarchs, these will offer only very top end accommodation and villas for those who can afford it. The former has even had a yet unopened road bridge built privately by aforementioned Russian investors. 1) The restaurant at Secret Garden at Otres. Quite simply the best fish amok I have tasted anywhere in SE Asia and the Tex Mex dishes (unsurprising as one of the co-owners is a Texan and has made his mark) are fantastic. You can eat at Secret Garden even if not staying at the bungalows, so catch an early dinner here for the wonderful sunset views and the inevitable happy hour. A wonderful venue with great ambience, good local Khmer food and seafood and very friendly staff). The restaurant is linked to the M’Lop Tapang charity (more of which later) and nearly all the staff are former street kids. One tip; if one of the staff comes up to tell you about the specials of the day, let them. This is part of their training and listening for 5 minutes is greatly appreciated. Another great wee spot with an amazing, home like ambience. I have to confess I abandoned the Khmer menu for the comfort food of cottage pie that night, a dish I had not eaten in a year and which was utter culinary bliss. There is only one restaurant I am going to advise to avoid, and that is the Snake House. Some may love this as there is a huge collection of snakes, exotic birds and crocodiles here. Personally, I felt the cages and cases were often far too small for such beautiful creatures. The eating area itself is lovely, tables surrounding a huge fish filled pool, but I also felt the food was overpriced and of lower quality than anywhere else I ate, so won’t be going back there. For drinking, there are a plethora of choices; from the occasionally seedy (and bar/taxi girl occupied) venues of Victory Hill to the casino hotels (where $50 dollar entry will get you entry to a $1000 dollar poker game). There are also all the local bars, where you are guaranteed some conversation with a friendly local and there are also the mainly farang owned bars of the Golden Lions Plaza. There are a number of NGOs operating in the area, but I must give a special mention to M’Lop Tapang. Founded in 2003 by Maggie Eno, they have several vocational training centres working with street kids, single mums and drug users. They train them in sewing, mechanics, English and catering (supplying Sandan which I mentioned earlier) as well as offering a drop in centre for drug users in crisis, doing relapse work in prisons and outreach work in the local communities. I had the great pleasure of spending a day visiting some of the centres and all the staff are doing amazing work. There are plenty of massage places (though not usually of the ‘Thai type’) but given my experience in Siem Reap, I would recommend the ‘Seeing Hands’ massage near Holy Cow. All therapists are blind, and all income generated goes to the therapists themselves, so a great massage and a worthy cause at the same time. Also worth a visit is the The Cambodian Children’s Painting Project, an NGO project on Serendipity Road which sells the kids’ art to help them and their families and to sustain the NGO. Unfortunately, places like Sihanoukville still attract child predators, though the situation has improved dramatically. I know you’ll be on holiday, but just always keep one eye on any apparently suspicious behaviour between tourists and young children. M’Lop Tapang are among those who have helped make huge strides forward in this area. You will see billboards everywhere on the subject, and I suggest you take a note of the hotline number. One action from you could save a child from abuse. And, like any new city you visit, there are areas to avoid after dark if alone. Some sections of beach at night can be full of kids on glue or drug users so unless somewhere quiet like Otres, never go for a solo walk. And the police; lovely and friendly, but like most areas in the region, sprinkled with a soupcon of corruption. If you’re a tourist, and hire a scooter, there is a 90% chance you will be stopped at some point. They will bring up; having no licence, no helmet (if you’re that stupid), lights on during day (it’s illegal) or speeding. Be nice, apologise and pay the ‘fine’ they ask for. (Often they will say ‘Well I will not fine you but if you wish to give me something’) Standard ‘fine’ ranges from $2 – $10 – if they see a wallet full of large denomination notes they will ask for more, so keep your main cash down to small notes. Lastly, the beach vendors. Some can be good, some can be bad. My hotel vetted those allowed on our stretch and I was happy to get a couple of massages there. But…please don’t fall for the puppy dog eyes of the child beach vendors selling bangles or sunglasses. By buying from them, you are encouraging them to not attend the NGO and local schools as their families see them making money, so always, always refuse them. 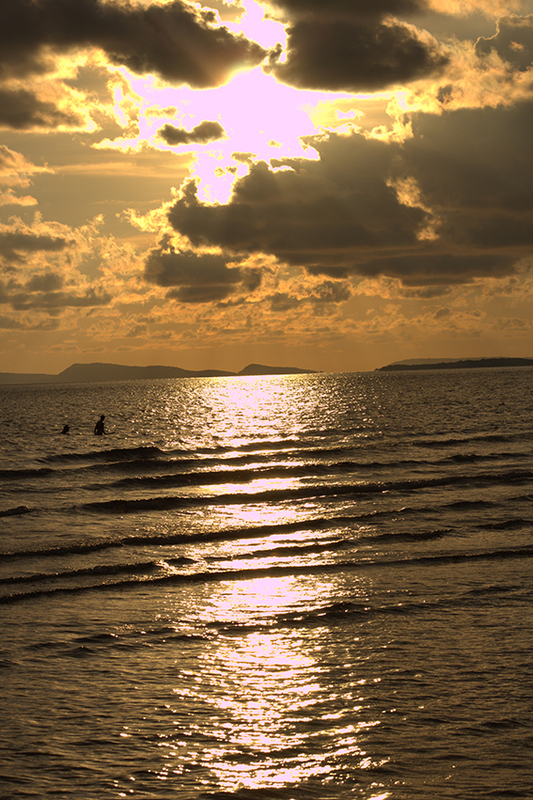 To summarise, Sihanoukville is beautiful. Still with largely unspoilt areas (Otres, Koh Rong), with wonderfully friendly Khmers always willing to smile and say hello (for me, Cambodia is now Asia’s land of smiles), great food, and just the perfect place to relax after a few days in Phnom Penh. Getting there is getting fairly easy, and it is a destination that suits all budgets. You can get somewhere to stay from as little as $10 dollars a night if you’re on a tight budget, all the way up to $100 plus if you want that extra degree of comfort. Till last week, Langkawi was my ‘chill out’ destination of choice, but now another has stolen my heart and it won’t be long till I visit her again. And what better way to finish than with some more spectacular sunsets? You know you’re seeing a good one when even the owners and staff are out taking shots. 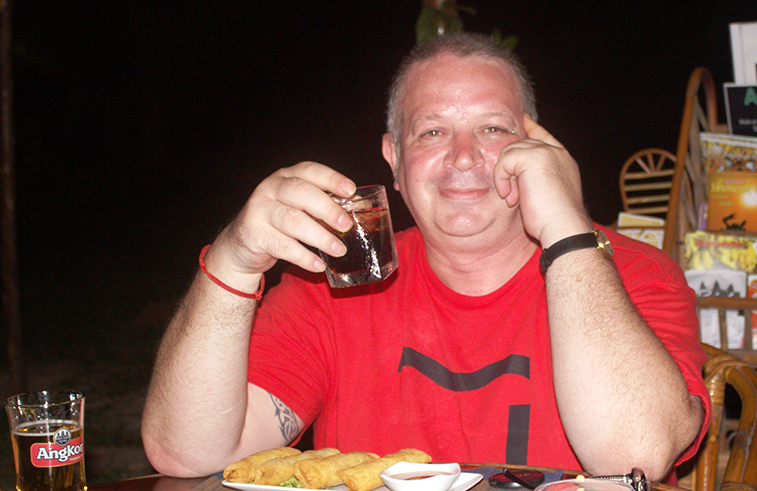 Iain Donnelly is an aspiring novelist currently living in Bangkok but considering relocating to Cambodia. He has travelled extensively throughout the region. Great post! I just spent a few days there through the New Year and loved it. One of the main highlights for me was the great food at reasonable prices. After seeing these photos I really now know this is my kind of place!!! And I hope to see both of you there for beers. I’m dying to finally get some time in Cambodia. Awwww I’m so jealous. The sunset scenery is just way too beautiful. I want to go there! Hi, will it be far f Siem Reap? How many hours of land travel. Thanks! This was a guest post, but I’d guess it must be 7ish hours by bus from SR.